The City of Hamilton was a little over seventy years old when the Wentworth Historical Society was formed in January 1889 to promote study into and publicise the "history, archaeology…and genealogy" of the area around the City of Hamilton, at the western end of Lake Ontario, known as the Head-of-the-Lake. As one way of achieving its objectives, the society undertook an active publishing program, most notably through its occasional periodical, Wentworth Historical Society and Records, which printed the best talks given by members at society meetings. The Wentworth Historical Society ceased functioning in 1925. At that time, its records and books were placed in storage, with the hope that the society might later be revived.By 1944 it was felt that the time had come for the formation of a new historical group in the area. In January of that year, Lt. Col. C.R. McCullough (1865-1947) convened a meeting of historically-minded residents of Hamilton with the objective of meeting with Dr. Charles W. Jefferys, president of the Ontario Historical Society to discuss the possibility of establishing a new local historical society in the city. At subsequent meetings throughout the month of February, a constitution was prepared and a slate of officers chosen. Art Gallery, on Main Street West near James, on March 31, 1944.
a government building erected in 1794 at the south end of the Beach. In fulfilling its motto, "Explore, Preserve, Relate", the society has been involved in many local activities. Guest speakers at monthly meetings have covered a broad range of topics about Hamilton and its environs: many of these talks have been published in the society's journal, Wentworth Bygones. The society has attempted to collect and preserve historical photographs of the area. This activity led to the publication of two popular volumes of local history: Around and About Hamilton, 1785-1985: A Pictorial History of the Hamilton-Wentworth Region (published in 1985) and its sequel, Hamilton: Panorama of Our Past (published in 1994). In 1986, the Society published a history of Hamilton's open air market, On the Market. Over the years, the soiety has sponsored several historical plaques, including one on the site of the King's Head Inn, to commemorate important people and events in the Hamilton area. In this regard, it has worked in close conjunction with the Joint Plaquing Committee of the Hamilton Historical Board. In 1990 a society-initiated project saw the historic 1890 City Hall clock and bell tower incorporated into the Hamilton Eaton Centre development. 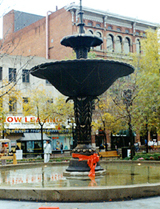 The society's next project was even more ambitious: the restoration of the Gore Park Fountain. Society members, local businesses and corporations, and residents of the community-at-large joined together, under the auspices of the Fountain Foudation, an offshoot of the society, to raise over $500,000 in order to rebuild the fountain, which was a centrepiece of Gore Park and a kind of focal point for civic life in Hamilton until it was demolished in 1959. 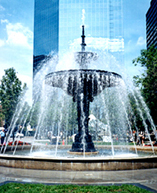 The newly-restored fountain was turned on in October 1996, one of the major events in the city's sesquicentennial celebrations of that year.